Everything you need is here all you have to do is just pack your suitcase!! This small 2 bedroom, 1 full bath unit is a great unit for those making the transition to Salinas. Although compact, it has plenty of room for the single traveler or couple. The master bedroom has a full size bed, ample closet space, curtains and a split a/c unit. The second bedroom has twin bunks, lots of closet space and a split a/c. The open concept living/dining is a nice size with local artisan furniture. The kitchen albeit small has a nice sized fridge, a stove with oven, and comes with nice counter and storage space. There is even a washer/dryer! Located in one of the most premier buildings, the Alamar, you will enjoy the prime location and the excellent amenities. Sorry, no pets and no smokers. $600/month plus all utilities. Minimum annual contract required. First / Last / Security required upon signing, as well as a $50 non-refundable cleaning fee. 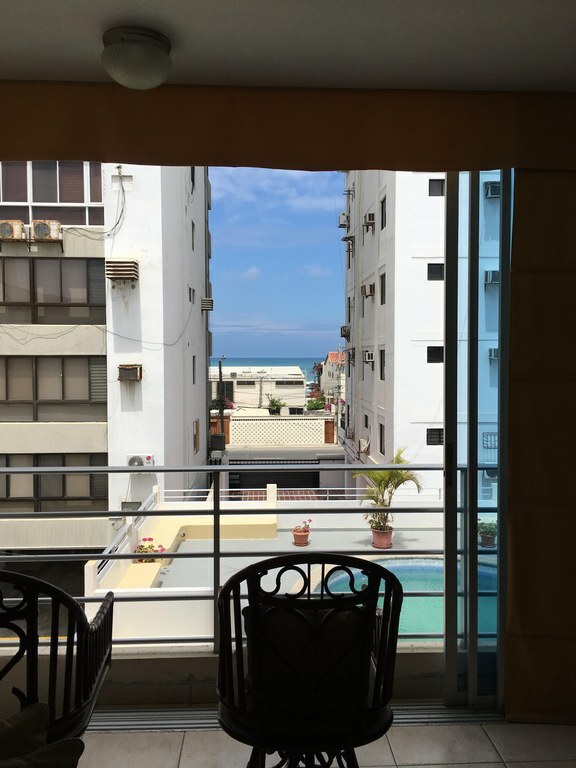 Walk across the street to the beach while you enjoy your stay in Salinas in this large lower-floor condo. With close to 1500 square feet this unit has three bedrooms, three full bathrooms, storage room, a large open living / dining room space with sliding glass doors allowing in a nice breeze, a good sized kitchen, as well as laundry area with washing machine and line-dry space. There are ceiling fans and air conditioners in all bedrooms. 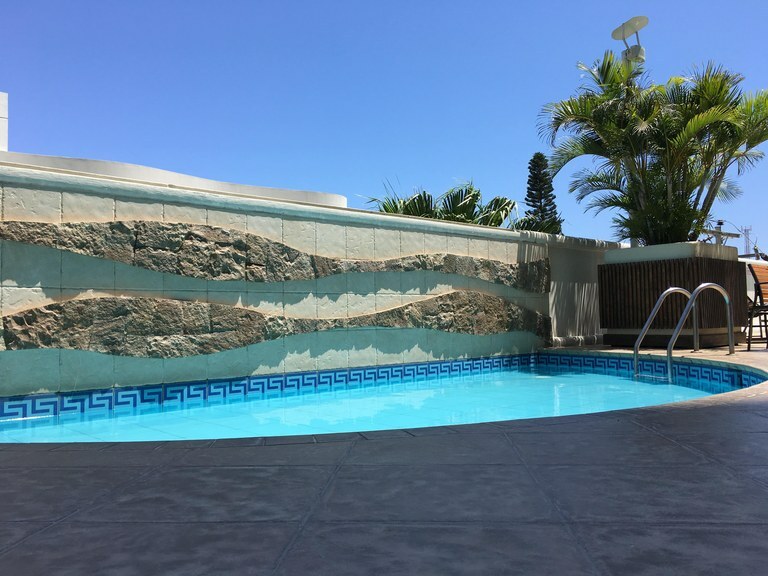 Quietly nestled in the end of The Las Palmeras section of the Salinas Boardwalk, this building has 24/7 security, two elevators, pool, sauna, steam room, BBQ area, meeting room with wireless internet. The unit comes with one assigned parking spot and storage locker. Sorry: No pets & No smoking. First / Last / Security deposit required up front on all stays, as well as a $50 cleaning/laundering fee. Year-Long contract rate: $880 + all utilities Please contact us for availability. 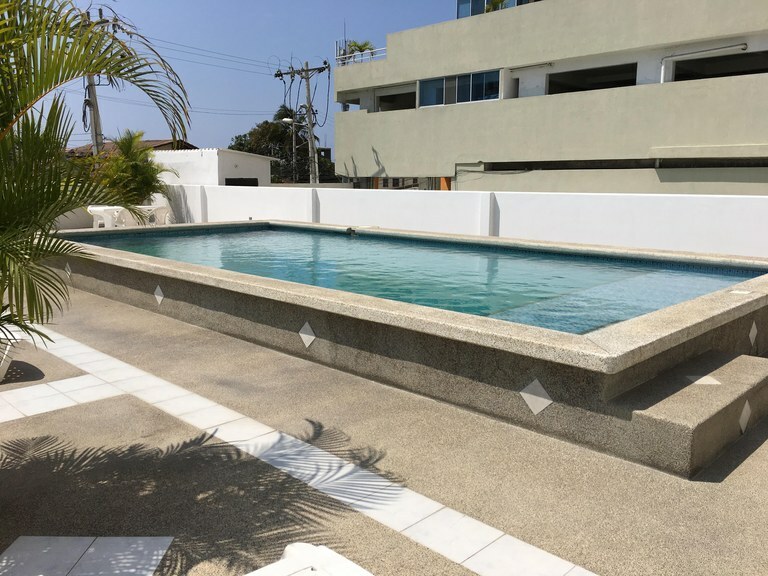 Located a block away from the Las Palmeras beach area on the Salinas boardwalk, this condo and has 3 very spacious bedrooms each with own closets, ceiling fans and air conditioners. There is an en-suite master bathroom as well as an additional full bathroom, both with hot water. The galley kitchen is quite functional and has a lot of cabinet space. The living area is a nice size and leads out to a closed in balcony which doubles as a separate dining area and second seating area. There are sliding glass doors that open all the way to one side to give you that feeling of having a balcony. Down the street you can see the beach. The condo is located on the third floor of a walk-up building which has 24 hour guards. High season monthly rate $700. Low season monthly rate $500. Rates do not include any utilities. Located in the San Lorenzo section of Salinas, this cozy 1 bedroom unit is great for the short-term stay in Salinas. 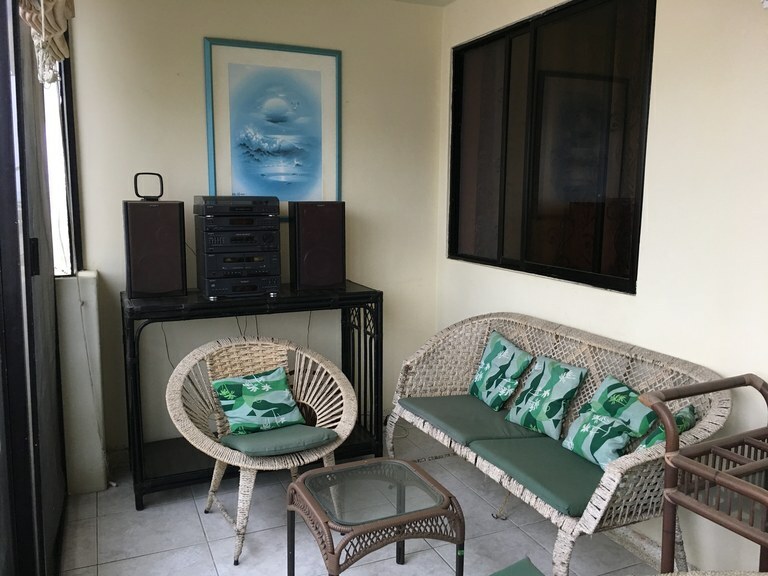 With just about 700 square feet, this unit has the basics to make your stay comfortable with a nice sized bedroom with en-suite bath, living/dining area with sliding glass doors looking out over the pool and off to the ocean, a small kitchen and a visitor’s bath. 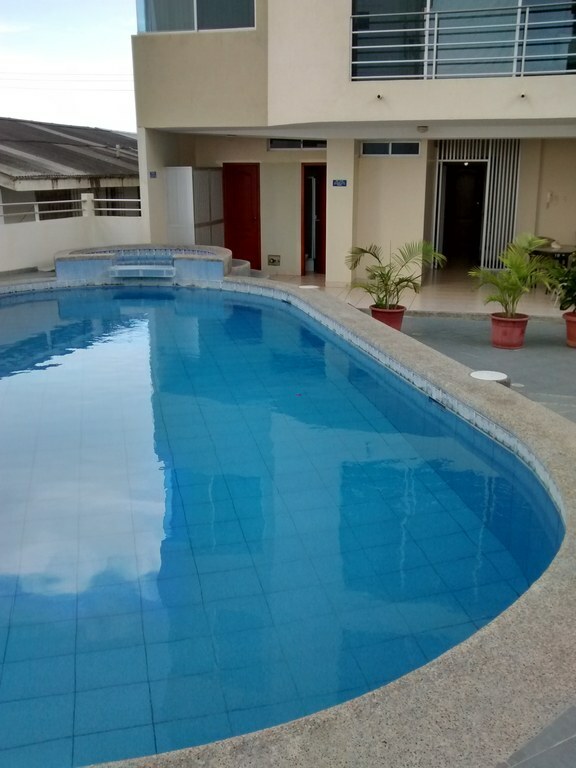 Unit available for short-term stays only as it is actively for sale. Please contact us for more details and availability. Condo for rent in Salinas - Hear the Ocean Call!! This is a cozy little condo located 1/2 block from the beach in the popular San Lorenzo section of Salinas. With about 700 square feet, this cozy two bedroom condo is ideal for a single traveler or a retired couple. The kitchen is small but functional and the open living/dining area have nice sliding glass doors to look out onto the pool area and see a partial view of the ocean. There are plenty of restaurants, shops, pharmacy, laundromat, church, all within walking distance, as well as the Boardwalk of Salinas. The building has an elevator, a pool and a 24 hour gate guard. Rates: High Season (Dec-April) $900/month. Low Season (May-Nov) $800/month. Year Contract $700/month. Rental rate does not include cost of any utilities. Enjoy your beach vacation here in this cozy condo, conveniently located on the Boardwalk of Salinas, walkable to all. This condo has 3 bedrooms, 2 full bathrooms, living/dining room, and a nice size galley kitchen with breakfast bar. The condo comes furnished and has an assigned parking spot. The building has an elevator, full-time security, and a nice sized pool. Rates vary depending on season and length of stay. Please contact us for availability. 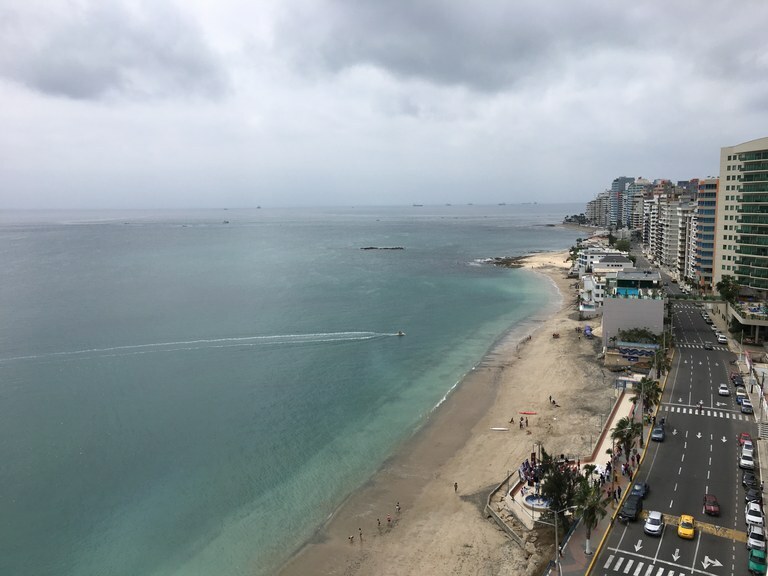 Enjoy fantastic views from this high floor condo in Chipipe of the best beach in town!! This penthouse level unit is a great place to spend your vacations just lounging in the hammock or relaxing at the beach. There are 3 bedrooms, 2 full bathrooms, kitchen, living room, dining room, and a maid’s quarters with full bath and laundry area. High season monthly rate $1500 Holiday rate $1800 Low season monthly rate $1200 Rates do not include utilities. Tenant will have to install own internet and/or cable tv service. Listing Agent can help with this process. Entering into this unit is like entering into your own private world! With over 2000 square feet of living space, this unit has more than enough room to make your move to Salinas a most comfortable one. 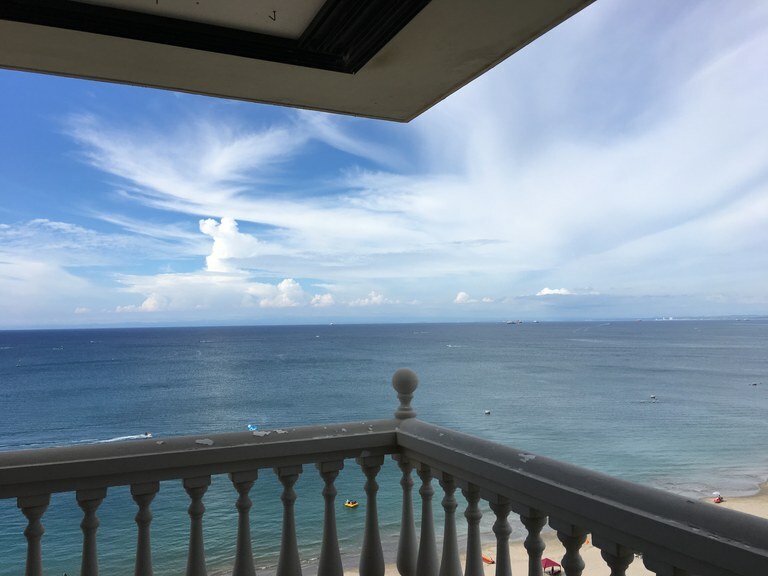 This unit takes up the entire top floor of the building and has awesome views of Salinas beach as well as Mar Bravo ocean. There are a total of 4 bedrooms, each with closets and air conditioning, and each having their own en-suite full bath with hot water. There is a large kitchen and formal dining room. 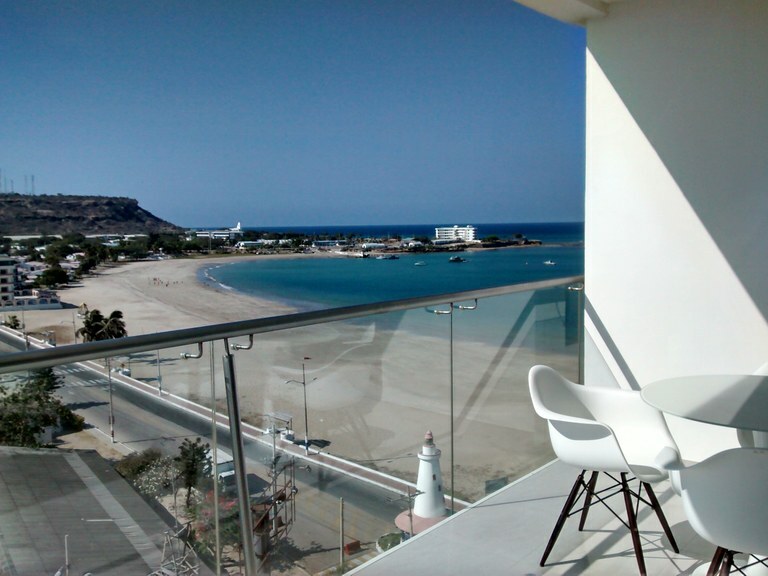 The living room has access to a huge balcony where you have spectacular ocean and beach views. The Master bedroom also has balcony access. There is a laundry room in the unit. The building has a large pool, a jacuzzy, outdoor shower and bathrooms, a racquet ball court, a large outdoor seating area with covered BBQ. There are 24-hour security guards. There is parking for 2 vehicles. Monthly rate does not include utilities. 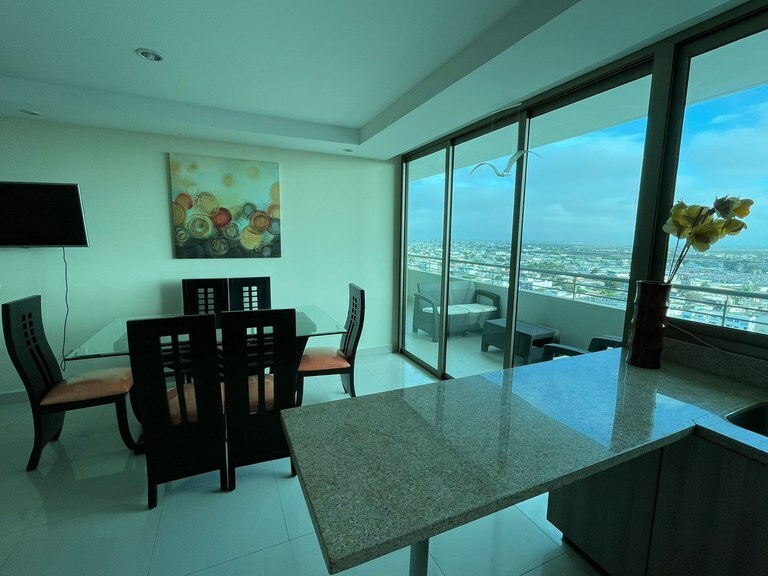 Rent this brand new, gorgeous condo in Chipipe and enjoy the ocean views and breezes from the large double balconies. The unit is approximately 1500 square feet and has 3 bedrooms and 3 full bathrooms. Each bedroom has its own air conditioner, television and built in closets. The living/dining room is open-concept as well as the open plan American-style kitchen, fully equipped with oven, stove, and microwave. Washer/dryer combo tucked away nicely. 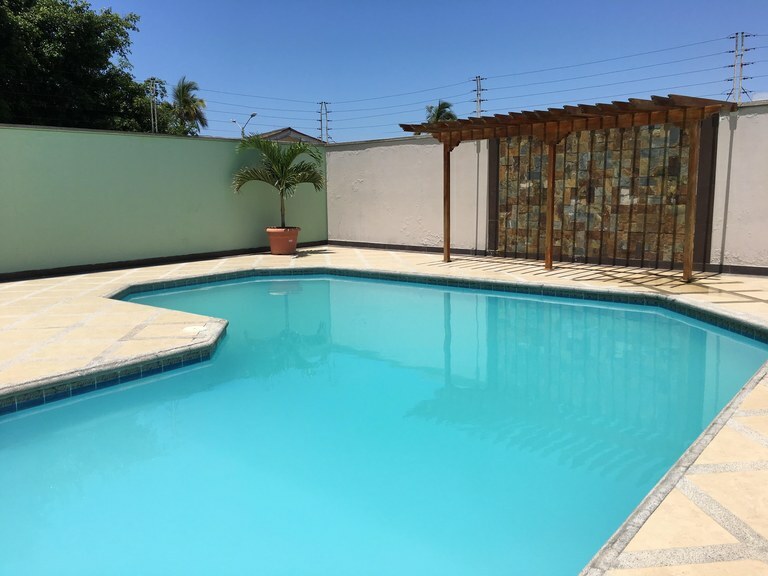 This Class A building has fantastic amenities including infinity pool, jacuzzy, sauna, steam room, gym, 24 hour security, double elevators and emergency generator. The unit is being rented fully furnished on a long-term basis only. Sorry no pets allowed. $1050/month includes homeowner fee. Tenant pays water, electric and gas separately. Tenant must contact own internet and cable television provider to install at tenant cost. Speak to listing Agent for details and availability. First month, last month and one month security due upon signing lease.